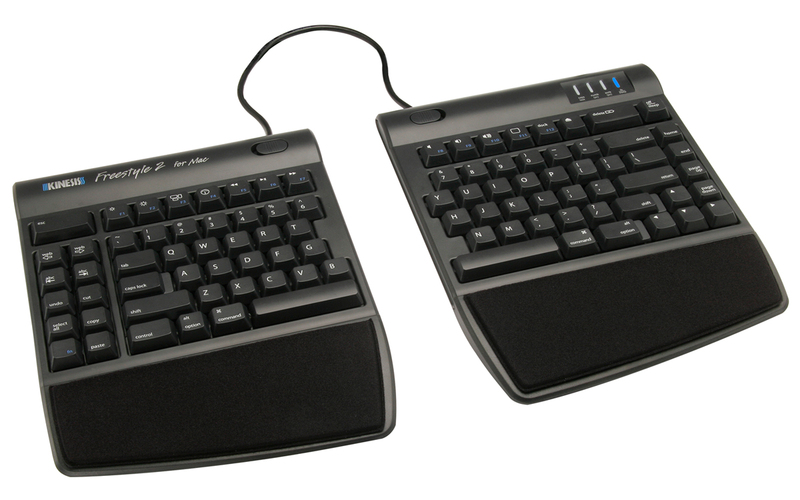 The Freestyle2 features low-force, tactile membrane keyswitches. At only 45 grams, this is at least 25% less force than most traditional and even many ergonomic keyboards. 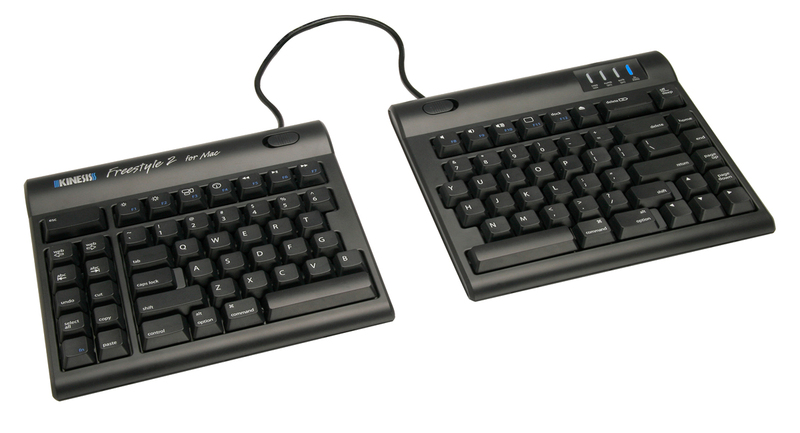 Rated at 10 million actuations, the keyswitches on the Freestyle2 will provide years of quiet, comfortable typing. Note: The Freestyle2 comes with an accessory that secures the two modules together at a pivot point. This Pivot Tether Accessory is designed primarily to secure the two modules during transport. 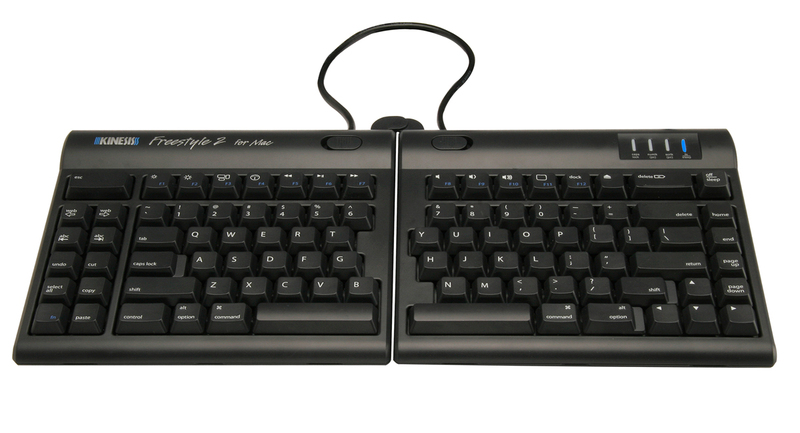 It may be used, if desired, to create a splayed (joined at the centre top) keyboard, however, this configuration will significantly limit the ergonomic benefits. Palm Support Accessory: Palm Supports can be attached to the keyboard to provide support and to prevent wrist extension. The Palm Support Accessory includes Lycra-padded Palm Pads that provide a soft surface for the Palm Supports and help to prevent pinch points on the underside of the palms. Note:Palm Supports will not fit on the V3 Accessory. 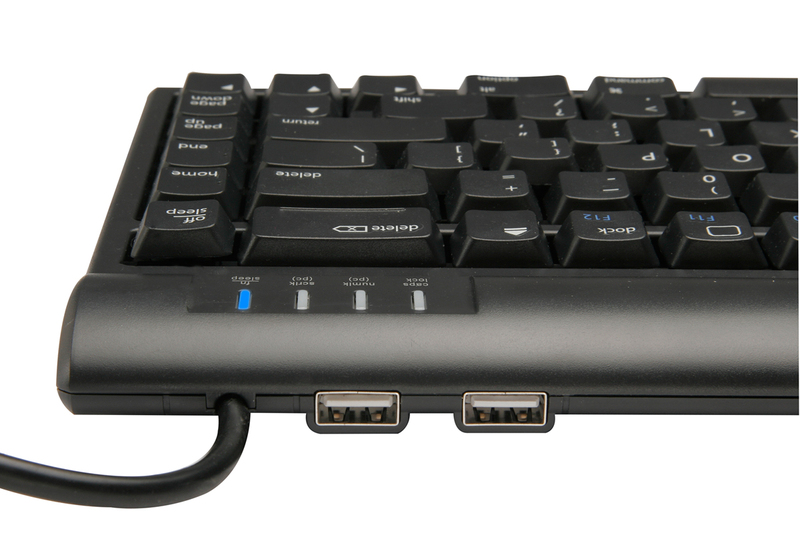 Palm Supports will fit on the keyboard itself, or on the VIP3 accessory, below. Can Decrease Forearm and Wrist Pronation - With a tenting accessory attached (either the V3 Accessory or the VIP3 Accessory), the Freestyle2 Keyboard gives users the option of typing with the palms slightly facing each other, rather than in the traditional "palms down" position that can often lead to fatigue or pain in the hands, arms, elbows and wrists. 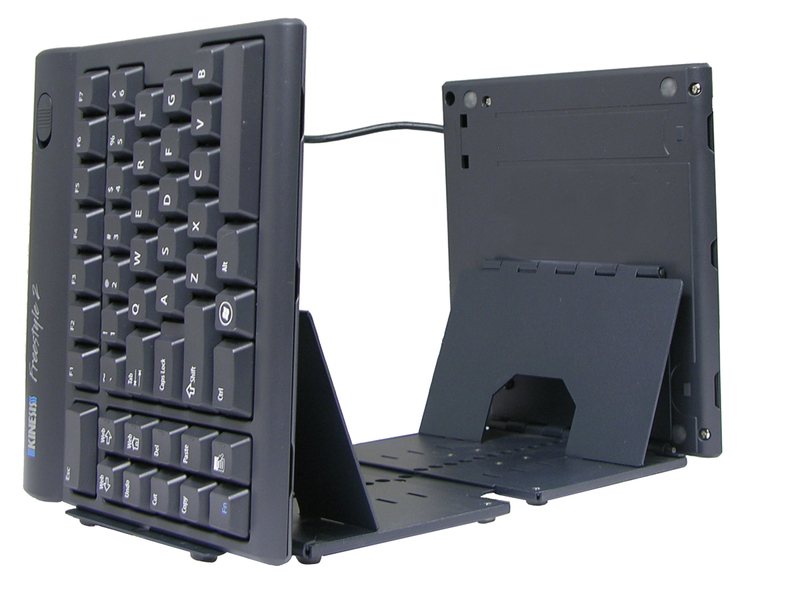 Both tenting accessories raise the inside edge of each keyboard module, offering tented angles of 5°, 10° and 15°. The V3 allows tenting alone; the VIP3 allows tenting with integrated palm supports. Learn More About Pronation. Variable Separation: The two halves of the Freestyle2 can be separated up to 9" apart, a range which is sufficient for the majority of users. A 20" inch separation is available for users with broader shoulders, or for use with the Ascent Accessory. Familiar Mac Key Legends: Standard Mac OS keys mean minimal adaptation time for experienced typists. Browser, Editing, and Multimedia Hot Keys: Easily accessible, driverless hot keys offer users the option of decreasing the number of mouse clicks and increasing productivity. These hot keys include volume control and mute keys, a calculator key, multimedia keys, commonly used browser functions such as forward, back and home, and application functions such as cut, copy and paste. A vertical raised ridge on the inside columns of the hot keys provides tactile feedback to the user. Atlas Ergonomics White Paper: Published in March 2010 by Atlas Ergonomics of Grand Haven, MI., this white paper reports on that company's intensive five-month study of a split keyboard design. The Freestyle Solo (the predecessor to the Freestyle2) plus the compatible VIP3 Accessory, was chosen for the project. Researchers studied the impact of the Freestyle Keyboard’s split design on the posture, comfort, and performance of approximately 80 software manufacturing employees, focusing in particular on the positions of the hands and upper extremities during keyboard use. The study found that 92% of participants used the Freestyle in its split configuration, rather than splayed (i.e. with the two modules connected at the pivot point). The degree of ulnar deviation was reduced across all BMI levels and body types with no reduction in performance for the duration of the study. At the end of the study 96% of participants said they preferred the Freestyle over their previous keyboard. Purchase the Palm Support Accessory if you would like to prevent wrist extension, but don't need to tent the keyboard. Purchase the V3 Accessory if you need to tent the keyboard, but don't need Palm Supports. The V3 Accessory can tent the Freestyle2 to 5°, 10° or 15°. 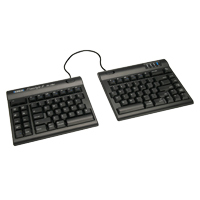 Common situations where this accessory is recommended include using the Freestyle2 on a keyboard tray, or with an inline pointing device that has non-removable Palm Supports. Note: Palm Supports cannot be installed on the V3 Accessory. If you suspect you might want Palm Supports in the future, purchase the VIP3 Accessory instead and remove them from that module until you need them.